There are no right or wrong ways? Or, as I’m wont to quote, “Nothing’s good or bad thinking makes it so,” (Hamlet II.ii.240 +/-). Oddly enough, this is topic comes in from another area of my metaphysical studies, and one of the particular elements I love about astrology is that it is a never–ending study. While this was about a certain type of meditation practice, as I considered the point, there is no one way to “read” an astrology chart. There isn’t a set of “right” and “wrong,” not with a scared science like astrology. The placement of the planets is hard, cold fact. The location of the planets in the night sky, or in the heavens at all, that is predictable, mathematically pure reason. In a single word? Yes. A few hundred years ago, science removed itself from the predictive psychology portion of the science, so astronomy and astrology were separated by church and state. Astronomy is pure since, the location of the planets, astrophysics and so forth. Rocket science to some. The meaning of the location of the celestial bodies? That’s my part, not right or wrong, but interpretative art — this is humanity, insane to its core. Just look the current news feed. The interpretation of what it means? That’s more art with less science. There is, at its heart, some easily digestible facts, but then, the meaning? More art with less science. 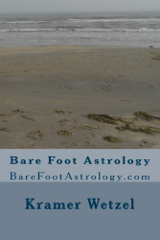 Part of what I work with in BareFoot Astrology, part of the original premise, is to remove the frankly sexist terminology inherent in the field, and use terms that are more descriptive with less patriarchal crap. But that could be me.